The Eagles have the second best list in the competition and have every area covered. 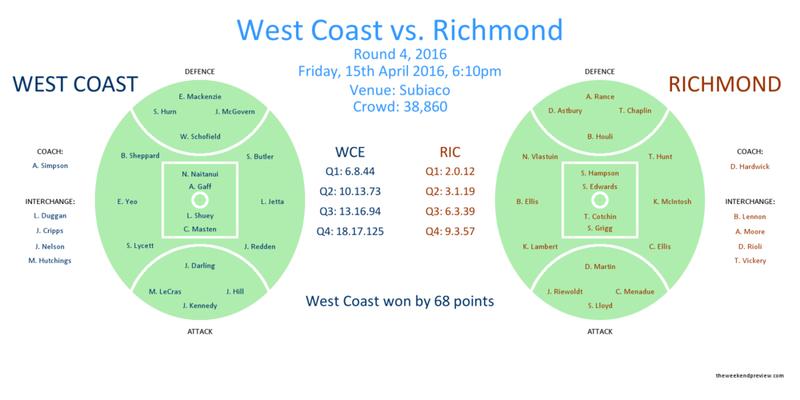 In Round 4 of the 2016 season, the West Coast Eagles gave Richmond an absolute spanking. The final 68-point winning margin undersold the level of Eagles dominance. The Tigers struggled to get the ball out of their defensive half, with the Eagles eventually winning the inside-50 count 60-27. Quite simply, the Tigers game plan wasn’t working and the Eagles made them pay. As a Friday Night prime time match, the game was a fizzer. To most people, the comfortable win wasn’t a surprise. After all the Eagles were coming off a Grand Final appearance in the 2015 season and they were considered by Champion Data to have the second best list in the competition at the time. In contrast, Richmond limped out of the finals in 2015 and had made a poor start to the 2016 season. But as the siren sounded on that Round 4 contest, no one would have foreseen Richmond’s assent to the top of the sport less than 18 months later. And as for the Eagles, within that same period their premiership window was considered to have closed and a re-build was now required. Entering the 2018 season, Champion Data had de-rated the Eagles to the 12th best list in the league. Yet 20 of the 22 that played in that Round 4 2016 match remained on the list. How can the same group of players decline so quickly? Inevitably, the concept of rating a playing list is intrinsically linked with on-field performance. As prime examples, both the Bulldogs and the Tigers seemingly turned mediocre lists into premiership winning teams in rapid time and suddenly they were praised for their depth of talent. Rather than study their playing lists, what the Bulldogs and Tigers have really taught us, is that a confident well-coached playing group is ultimately what brings on-field success to a club. And so it is, that West Coast has waved off the doomsayers and has 7 wins on the board after 8 rounds. Within 8 weeks, the perception of the club from the wider football public has changed drastically. And their top of the table clash this week against the reigning premiers rightfully deserves top billing. A lot can happen in 2 years. There is one factor that has underpinned West Coast’s success in recent years and that has been their strong home record. Much of this success was attributed to the long and narrow dimensions of their previous home ground, Subiaco (most recently known as Domain Stadium). However, this myth seemed to be de-bunked this year with the Eagles winning 4 of their first 5 games at their new home ground Optus Stadium, which is comparatively shorter and wider than its predecessor. The consensus being that the parochial home support is ultimately what has given the Eagles an edge at home. However, the truth is potentially not so simple. When considering West Coast’s form outside of Western Australia in recent years, there performances on long and narrow grounds (defined as greater than 160 m in length and less than 130 m in width) have been notably more impressive. Since the start of 2016, the Eagles have won 66.7% of all their matches on long & narrow grounds, with their wins coming against quality opposition in Adelaide, Port Adelaide and GWS. In contrast, on all other grounds their winning percentage drops to 37.5%. Whatever the reason, whether it be familiarity with the dimensions or psychological, the record speaks for itself. Similarly to West Coast, Richmond has now established an imposing home record of their own. In fact, Richmond has the greatest home ground advantage of all, given that the Grand Final will be played at their beloved MCG for the next 40 years at least. Richmond has won their last 13 games at the MCG and in their current form they appear unbeatable there. It is only away from the MCG that the Tigers have looked vulnerable. For instance, since the start of last year Richmond has lost 4 of their 6 games on long and narrow grounds. Hence, if the match was at the long and narrow Subiaco this week, it would be difficult to tip against the Eagles. So what affect does Optus Stadium have on the contest? Figure-3 presents a comparison of the dimensions of Subiaco (Domain Stadium), Optus Stadium and the MCG. Optus Stadium represents the perfect middle ground between the dimensions of Subiaco and the MCG. In fact its dimensions of 165 m x 130 m represent almost the boundary point between short & wide and long & narrow football grounds. So with Optus Stadium still relatively new to the Eagles, this weeks match represents as close we can get to a match on neutral territory between the two teams (home crowd notwithstanding). The winner will rightfully deserve to sit alone at the top of the Ladder. Champion Data. (2016). “2016 AFL Prospectus”. Champion Data Pty Ltd.